When he moved to Tuusula, the poet Juhana Henrik Erkko (1849–1906) wanted to build a house as close as possible to the place where Finland’s pre-eminent author Aleksis Kivi had spent the last months of his life, cared for by his brother Albert Stenvall. In 1902, next door to Syvälahti croft, a house was built to a design by Pekka Halonen; among its special features were six handsome brick fireplaces (also designed by Halonen). 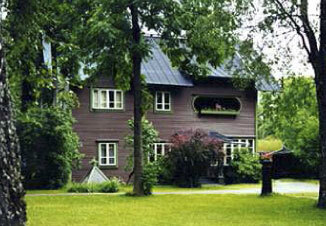 During Erkko’s time there the house was furnished in the ‘Old Kalevala’ style. After his death the vicar’s widow Ella Paloheimo bought the property for use as student accommodation. Since then the house has had numerous owners. J.H. Erkko is known as a fervent poet; in fact he was the only member of the artists’ community to participate in Tuusula’s political life. A strong sense of national identity and the Kalevala tradition formed the basis for his poetry. The Finnish National Anthem, Laulu Vuokselle and Hämäläisten laulu are familiar to Finnish children from their school song books. The play Pohjolan häät dates from the zenith of his creative powers during his years in Tuusula.